It’s raining a bit, but I don’t mind. I have two lucky things at my side today: my co-worker John and diner matzoh ball soup! 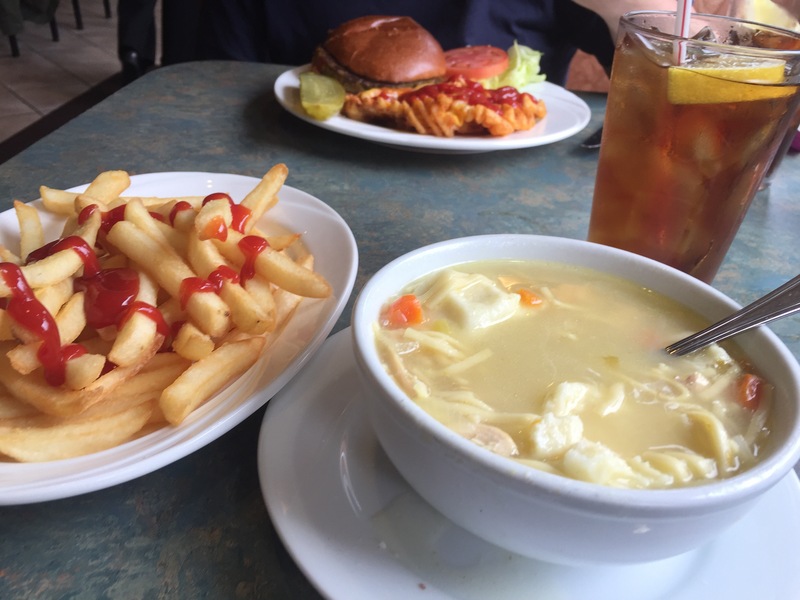 The soup ($4.95) was an interesting hybrid; it tasted definitely Jewish, with the chunks of chicken, white onion, carrots & celery swimming along with matzoh balls (not airy, big but not like lead) and, what I can surmise, kosher-for-Passover noodles? Along with the soup, I had 1/2 a plate of fries, mainly because 1. Potatoes are acceptable, if necessary, foods still good to consume during Passover, and 2. These diner French fries are great; they’re crispy, hot & freshly fried, every time. “I was thinking about a side of broccoli, but then I thought: ‘No'”, I commented out loud. “Next week is salad week,” we both promised ourselves.